Our cottage has been aflutter with activity this week. Dennis has been sculpting the berm at the front of our property in preparation for planting trees, shrubs and flowers. 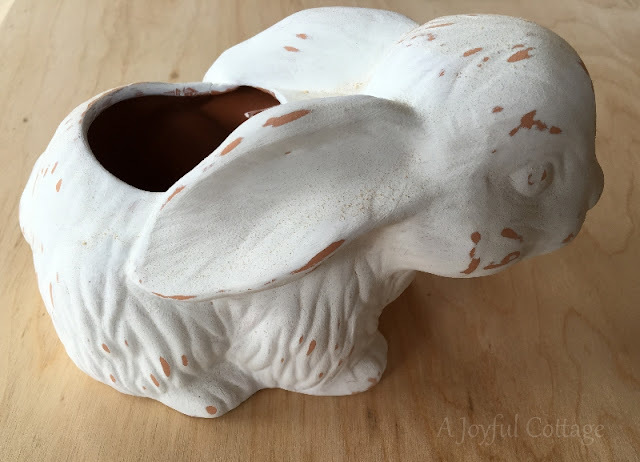 I finished the bunny planter makeover with just a light distressing, and now will plant some pansy seeds in her little bowl. 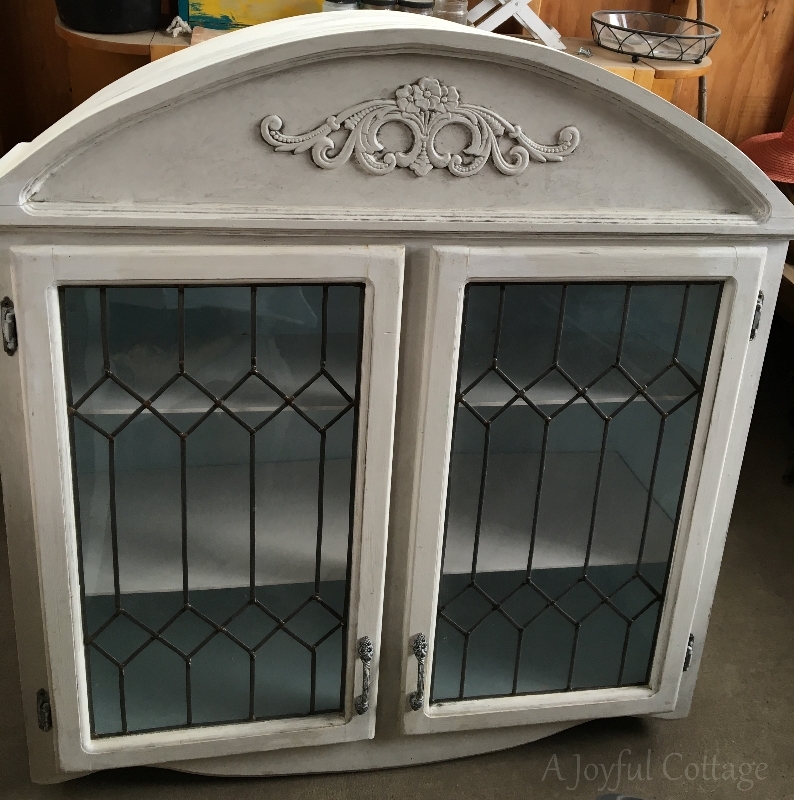 Last Saturday we took a trip to Nampa, Idaho (about 3 1/2 hours from our home) to pick up this wall cabinet at Sweetly Chic Boutique. This is Amanda, proprietess of the shop. 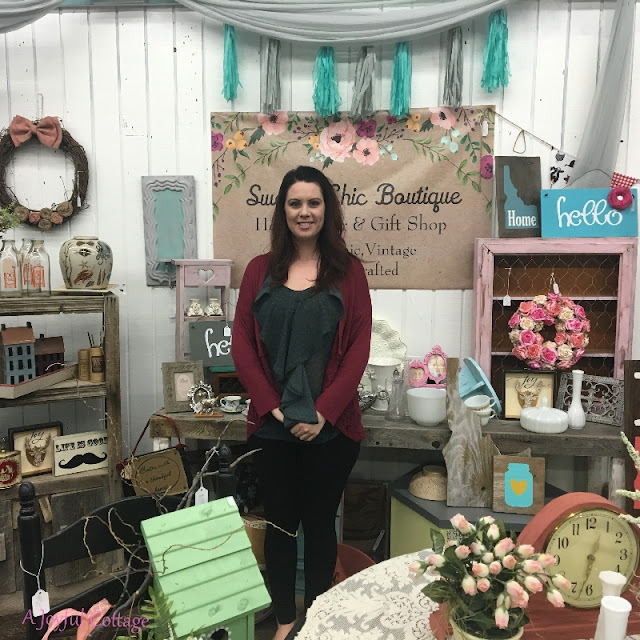 Amanda is sweet and accommodating, and her shop has a lot of pretty things very reasonably priced. If you get to downtown Nampa -- a great place to shop and eat -- be sure to check out Sweetly Chic Boutique. It's in the Village Square Mall with other vintage and antique shops and a superb Vietnamese restaurant, where we had lunch. This is a dresser we found and purchased around the corner at the Idaho Thrift Store. You can see in the photo that the top is pretty beat up and there are other rough places on the piece; but it's all wood, has good bones, and we got it for a good price. I've already sanded down the top and have given it one coat of dark walnut stain. I may put another coat on, and then I'll paint the rest of the dresser. I'll show it to you when it's finished. On a side note, remember I said I'd probably decoupage the plastic pot that holds my Christmas Cactus? Well, I did. I used some of my fabric scraps for this quick fix, and I'm satisfied with the results. It looks so much better than the strapless sundress the pot sported previously. Are you familiar with the quarterly magazine Artful Blogging? 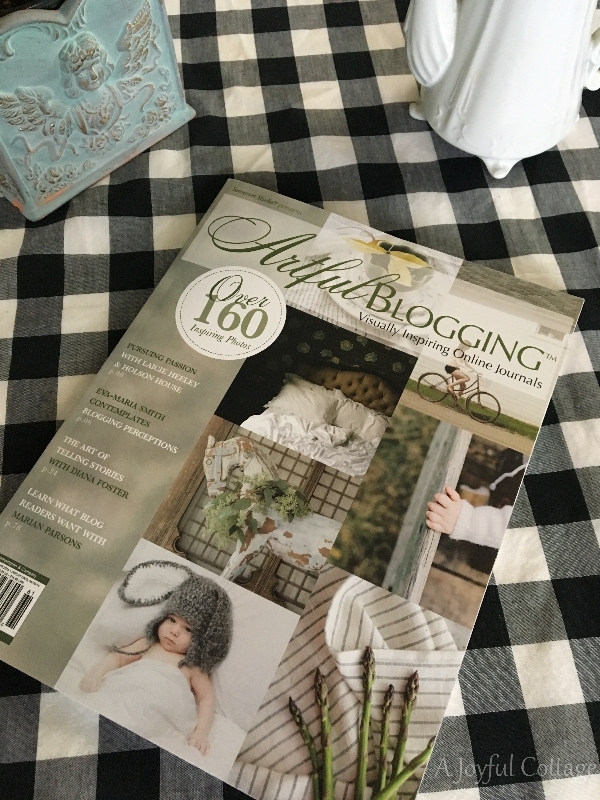 I received a complimentary copy of the Spring issue in which they featured my blog's header in the Banners We Love section. Here it is at the top of page 132. It's surreal to see my header and name displayed in this beautiful publication. The other featured banners are so fabulous; I'm just thrilled A Joyful Cottage is included. 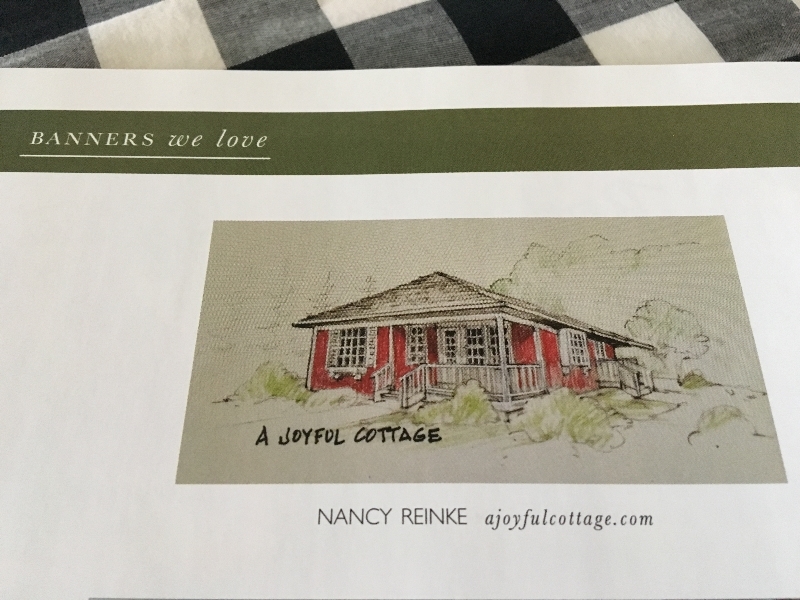 All of the credit for the banner -- a rendering of our cottage -- goes to Dennis Reinke, my talented artist husband, incredible architect (retired) and all around wonderful man. Artful Blogging is a stunning 144 page magazine with articles and photography created by bloggers themselves. I'm learning a lot from the content about blogging and photography. 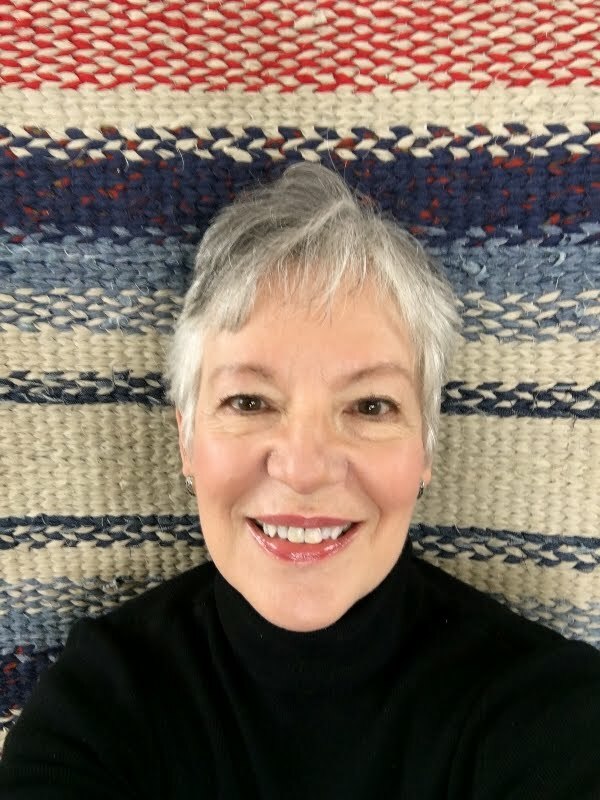 Marian Parsons of Miss Mustard Seed fame wrote an enlightening piece about what she learned by conducting a readers survey and how it motivated her to change the direction her blog was taking and "write from the heart." 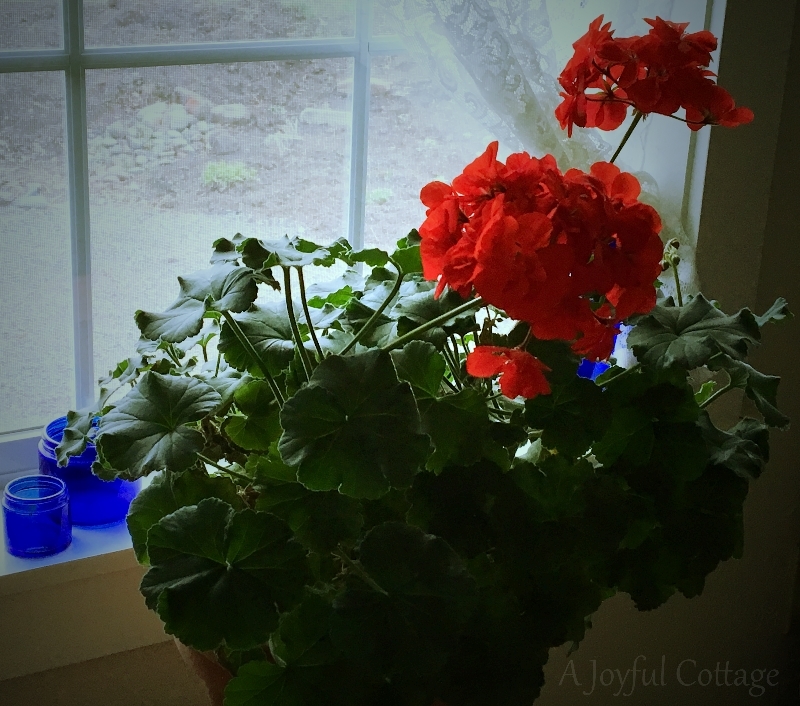 A final photo taken this morning: my studio geranium. Dennis and I will enjoy a simple Easter celebration this year. Worship at our church and then most likely a drive and lunch in a restaurant afterward. However you spend Easter, I pray you'll be blessed. "He is not here, for He has risen, just as He said. Come, see the place where He was lying." 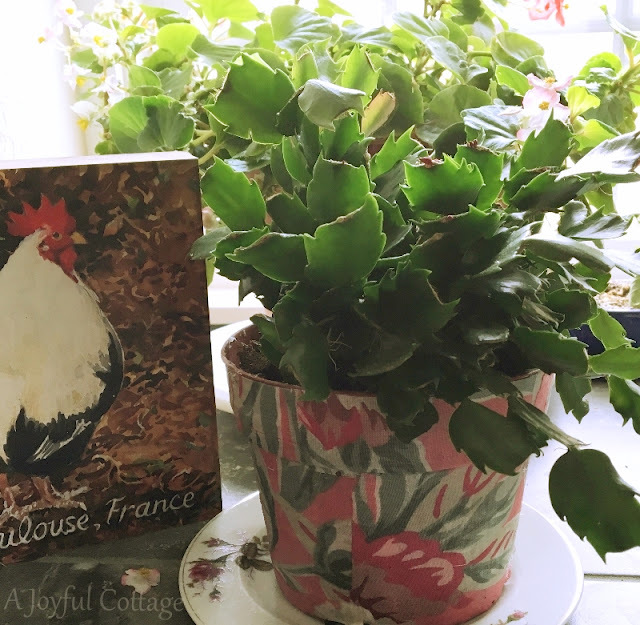 I love Artful Blogging, and your banner is great :) It looks like you've been busy around the cottage, Nancy. Have a good weekend! Lots of creative things happening at your cottage. I'm eager to see the "after" photos of your thrift shop find. Congratulations on being featured in the magazine. Congrats on your header appearing in Artful Blogging, what an honor. It couldn't have happened to a nicer banner! A blessed Easter to you and your husband, Nancy. Congrats on the Artful Blogger of your sweet banner. You got a great couple of treasures on your trip. Happy Easter. what a sweet cabinet. Curious as to how you came to locate these pieces of furniture at such a distance from your home? I think this is first time I've commented on your blog, but I enjoy it tremendously. A home in our neighborhood just applied red siding and made a huge improvement in their home. I thought of you and your lovely cottage as they added this beautiful color. The cabinet is very pretty! Congratulations on winning a spot on the Artful Blogger book. Your banner is beautiful!! Wishing you a lovely Easter! So very authentic . . . you are . . . I take a look at Artful Blogging when I go to Barnes & Noble . . .
Congratulations on your banner being in Artful Blogging. I must find a copy and start reading - and I really must get back to blogging again. Happy Easter, my friend. What a beautiful day we celebrate! As I read the last message, my eyes are tearing up in such joy. Easter has to be my favorite holiday; I woke up this morning smiling, giggling like a little girl, looked out the window, saw the bright moon (it's still dark when I get up!) and I just thought, "for those of us who believe, we have THE BEST AND BIGGEST HOPE anyone could ever have!" I am elated. Nancy, BRAVO!!!!!! Your header got into the magazine! Do tell, did they find you or did you enter it? And I JUST LOVE your little cabinet that you got! Vintage leaded glass and all...that is going to make a big statement somewhere special in your cottage. Well tomorrow, we are going to drive to the lake nearby and have ourselves a little sunrise service. We take a thermos of tea, our bibles, poetry, then watch the sun come up. We used to do this when we lived right across the street from the ocean in Massachusetts. We'd meet a few friends from church and worship on the sand. Enjoy your Easter and WE ARE BLESSED! Ah! Sweetness EVERYwhere in this post! The dresser is fabulous. I can already "see" the finished product in my mind's eye. What a great post! Congrats on being in the magazine. I need to check into it. You two are busy and you will enjoy planting that berm. So happy for you Nancy, to be featured in another magazine! How exciting! Your wall cabinet is so nice...where will you put it? Can't wait to see what you do with the dresser. I love your decoupaged pot too. I want to check out the magazine to get some ideas for my blog, which needs a lot of help!!! 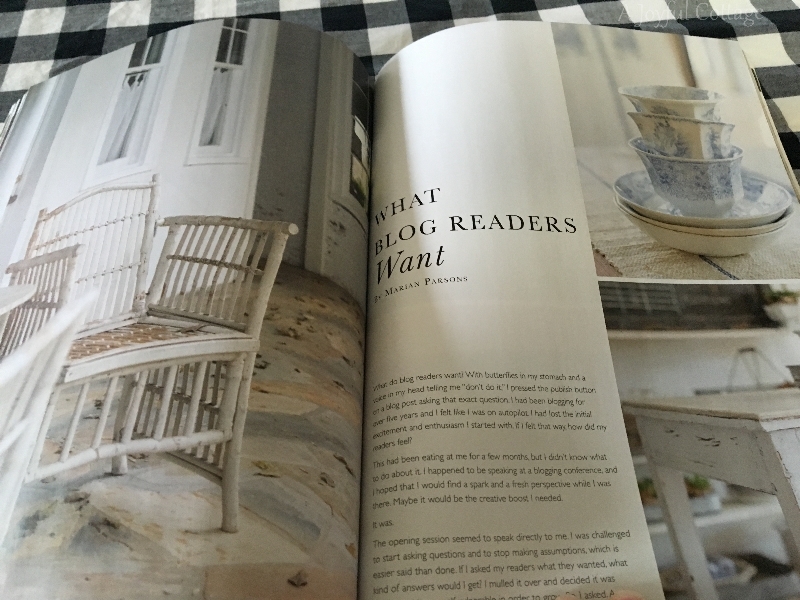 Congratulations on the feature in Artful Blogging, Nancy! 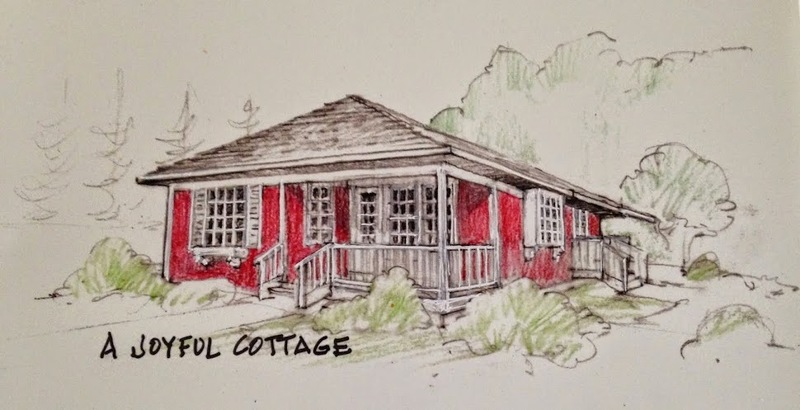 I had no idea your husband painted the rendering of your cottage. He is a very talented man and must be thrilled to see his work in such a wonderful publication! We woke up to a few new inches of snow this morning, so I'm envious that you two are out digging in the dirt! Happy Easter! I love your sweet wall cabinet, and I can't wait to see your dresser when you're finished. Both are wonderful pieces! 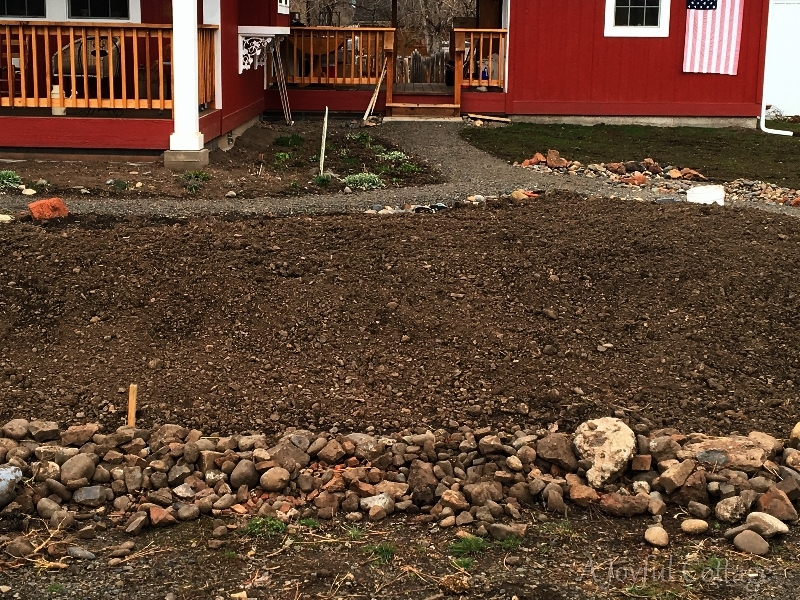 I look forward to seeing your berm planted up and growing. Wishing you a lovely Easter weekend - and sending congratulations on being featured in that lovely magazine! I love posts like these... just a little bit of everything random and lovely! 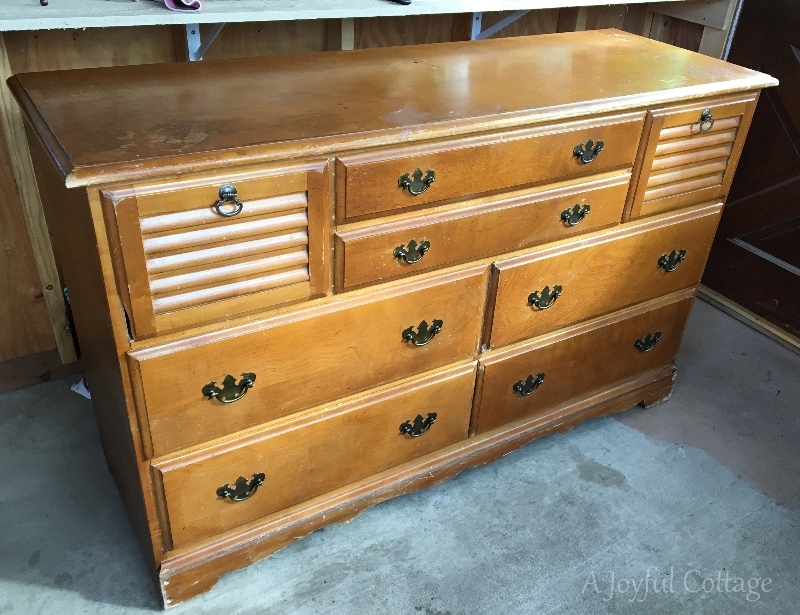 Your new cabinet is gorgeous, and the dresser - I can't wait to see what you do with it! And looks like Dennis is going to a lot of work on the berm, can't wait to see the end result of that too! Congrats on your blog header being shared in such a delightful magazine, I've never heard of it, but I need to look it up! Always a delight to visit with you Nancy, and praying your Easter is sweetly blessed! I hope you enjoy a lovely Easter. Wow!! You are on fire with the features lately, lady!! How exciting and well deserved! Congratulations! I am on a quest to find that magazine now so I can see Dennis' artwork in print!! Happy Easter my friend! Happy Easter! I am so happy for you. That is great to be featured. Yippee for Dennis. I love your geranium. It looks so lush! Did it spend all winter inside? I absolutely adore artful blogging! congrats on the feature. You deserve it!! How exciting to see you header featured!! Dennis must be thrilled as well! I really like the berm you are working on , that is alot of work. What fun to travel and pick up your sweet cabinet and I'm sure there were other treasures in the cute display that Amanda has. You must be having alot of fun getting ready for the growing season ahead....your place is looking great!! 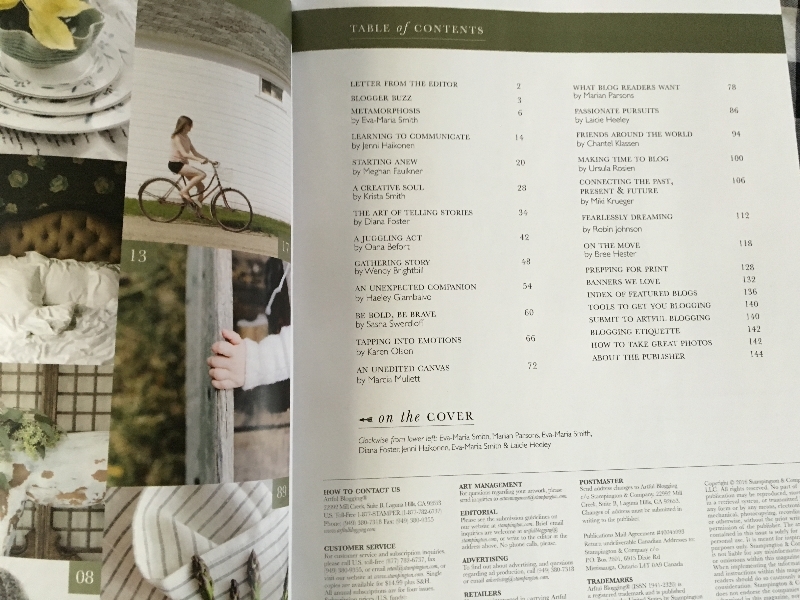 Artful Blogging is such a beautiful magazine; congrats on having your header featured!! Your decoupaged pot turned out great and what a fun idea. I'm guessing that your dresser makeover will be quite stunning. You're making me want to go out on a hunt for furniture to refinish. On my list is a headboard for our bed. Lovely to catch up with your blog, Nancy. Wishing you all the best.